Stablegear Classic Style Breastcollar. This style will work for most types of saddles. Breastcollars improve saddle stability, especially riding in the hills. The Classic features snaps that clip to saddle. Stablegear Classic Style Breastcollar. This style will work for most types of saddles. Breastcollars improve saddle stability, especially riding in the hills. 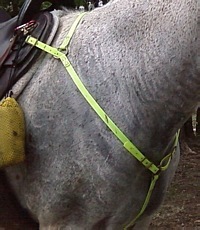 The Classic features snaps that clip to the dee rings on the front edge of the saddle, over the neck, and to the girth. All straps are adjustable. All snaps are attached using conway buckles so they can easily be replaced. I normally place the adjustment conways on the chest to should straps at the chest ring end. There is no extra charge to put them at the shoulder if you prefer. If your girth doesn't have a dee ring you will need a girth loop; to snap it to. Or, you may request a longer chest to girth strap with a loop in the end. The SG Classic Breastcollar can be made from Beta Biothane or Hi Flex BioThane coated webbing. The Beta is soft and pliable in all weather with leather grain imprint and very easy to clean, no oiling necessary. 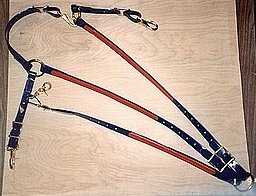 I usually use the heavyweight coated beta but I will use the standard weight if you are looking for lighter weight tack. The Hi Flex BioThane has a harder, shiny finish, but is still pliable. Also very easy to clean. I normally use 3/4" width strapping. 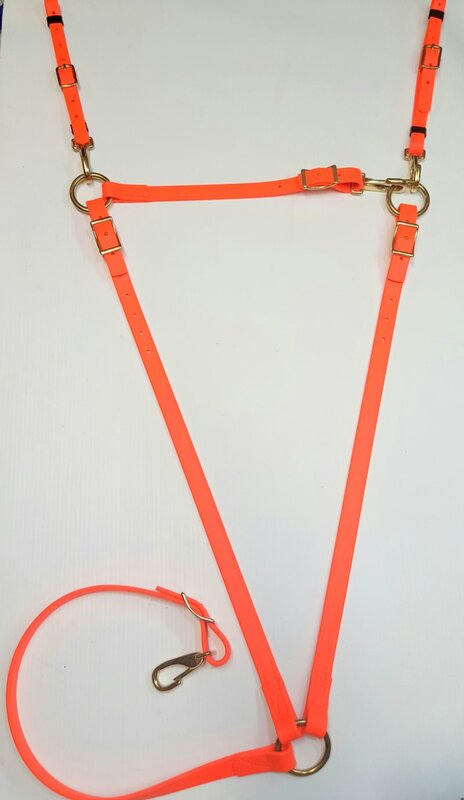 You may request 1" wide shoulder straps (not available in all colors) and/or thinner straps to the saddle. This item is made to order. I only keep a very limited stock made up on hand. I almost always have black made up in stock. My standard size fits most endurance/competitive trail horses. If your horse is exceptionally large or petite include message with order or email/call.